Livell is back with some new smart cycling helmets, following the success of the Bling helmet series. Like Bling, the new Livell helmets pack in several smart features, but this time in a slicker package that's lighter and more subtle. There are three different models this time, the BH81H, MT1 and the KS2, the latter being for kids. The first two are very similar bar the built-in heart rate monitor - not featured in the MT1 - and the more rounded design of the BH81H. 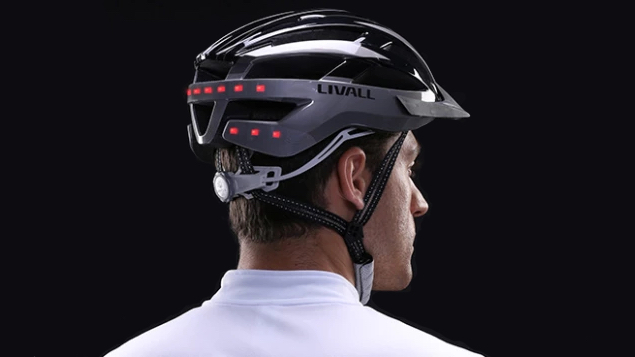 Other than that, both come with smart warning lights built into back of the helmet, with turning signals so you can indicate to drivers and cyclists behind you. There's a built-in 3D gravity sensor, which can detect if you've fallen off the bike and, if so, automatically send an SOS message to a selected contact in your paired smartphone. As for communication, there's a built-in walkie talkie that lets you speak to other cyclists if you're all out biking together (assuming they also have a Livell helmet, of course), while the wind-protected mic lets you take calls on the go without distortion. There's a paired remote that sits on the handbars and lets you perform all these functions, including controlling your music. The integrated bluetooth speakers in the helmet mean you'll be able to listen to your tunes without blocking out all outside noise. As mentioned, only the BH81H comes with the heart rate monitor, which will also sound an alarm if it detects you're exceeding the safety range. The helmets are currently on Indiegogo, where they've already shot well past their target, and will be shipped to backers in November.